First, if you’re not familiar with the Animal Kingdom Lodge and Animal Kingdom Villas area, it’s important to note that each go by a different name. The Lodge building is called Jambo House, whereas the Villas reside at Kidani Village. Whether you are driving or using Disney transportation to get to the resort, you will want to stop at Kidani Village for this tour. If you drive and choose to self-park, it can be a very long walk from where the parking lot elevator takes you to the central lobby area. Fortunately, you’re walking indoors with glimpses out on to Kidani’s savannas, but make sure you remember which elevator you used so you can find your car again. I won’t say that I lost my car when I did this tour, but I will say that I took the scenic route to find it. Sanaa is located below the check-in area in the center of Kidani Village. When I checked in at the podium for the 4pm tour, I was the only only guest. The Cultural Representative leading the tour, a young woman from Botswana, waited 10 more minutes to see if anyone else would be joining us. No one did, and the woman seemed a bit surprised that I was there. I guess not many folks take advantage of the tour. Since I had a private tour, the Cultural Representative took her time and was very patient with my taking photos. If you haven’t been, Sanaa is gorgeous. Aesthetically, it is my favorite restaurant on property. 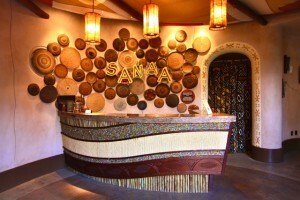 “Sanaa” means artwork in Swahili, and the place is covered with a diverse collection of beautiful pieces. 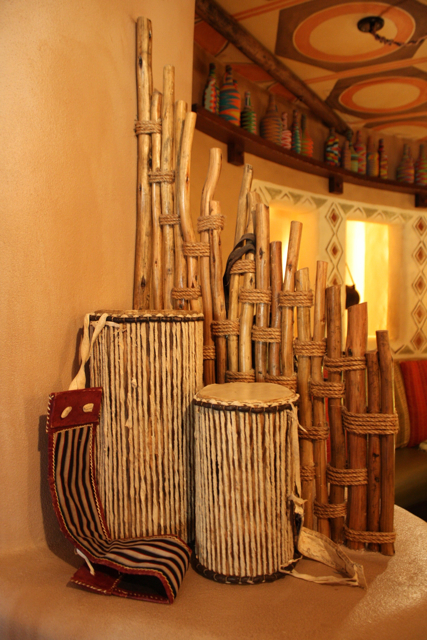 The walls are adorned with a items from various African cultures so as to evoke a trading market atmosphere. Beads and necklaces are prominently featured and are a nod to the word “Kidani”, which is Swahili for necklace. The Representative led me around the intimate dining area explaining the cultural significance of each of the African pieces. She even pointed out a Hidden Mickey as well as Sanaa’s own Pride Rock. 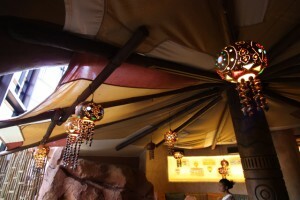 Given the small size of the restaurant, I was amazed at how many different design elements had been incorporated. Everything was beautiful, though I did question the logic of displaying beaded loin cloths directly behind the heads of eating guests. My guide laughed, and said she often thought the same thing. The canopy is made from ship sails in this boat-inspired room. We finished up in the bar area, which is now on my lists of places to return. Even at 4 in the afternoon, the bar was cozy and inviting. Here the Cultural Representative turned me over to one of Sanaa’s chefs. The chef came out and explained how they use tandoori ovens to make naan bread as well as slow cook their meats. 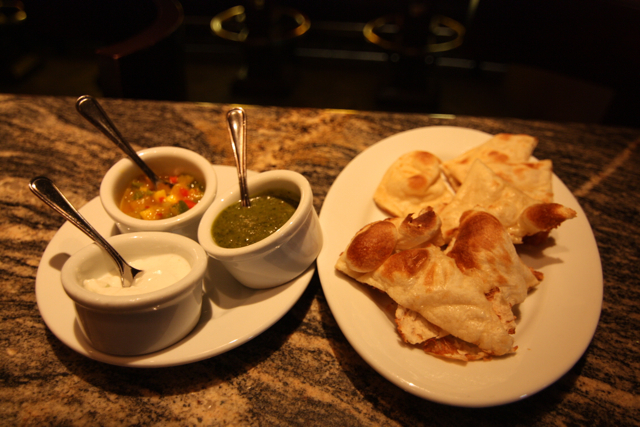 He also brought out a sample of their Indian-style Bread Service appetizer, including fresh naan and three different dipping sauces. Since it was only me on the tour, I had the whole thing to myself. Fortunately, I quickly made friends with two ladies at the bar who were more than happy to help me polish off the food. If you order this appetizer in the restaurant, you get to choose from a selection of nine sauces. On the day of my tour, they gave me the cucumber raita, mango chutney and something green that I still don’t know what it was. I happened to come back for dinner with a group, and we had two orders of the bread service. Rather than having us pick six sauces, the waiter brought us all nine options. This was fabulous, and I highly recommend doing the same if you find yourself with enough people to share. Overall, the tour was short and sweet. Even taking my time time to eat and chat with my new friends, I was out of there in 30 minutes. I’m sure with a larger tour group asking questions, it could take longer. If you do go, I highly recommend asking your Cultural Representative about their home country and experiences. My guide was a busy handling a guest conundrum at the end of my tour, so we didn’t talk much. However, I have chatted up the Cultural Representatives over at Jambo House, and they all were very happy to share. The Sanaa Cultural Tour is a great respite away from the parks. If you are staying over in the Animal Kingdom area or just want an excuse to come check out the gorgeous resort and savanna, a free tour is just the ticket. A great trip would be following this tour with a drink at the bar or an early dinner at Sanaa. 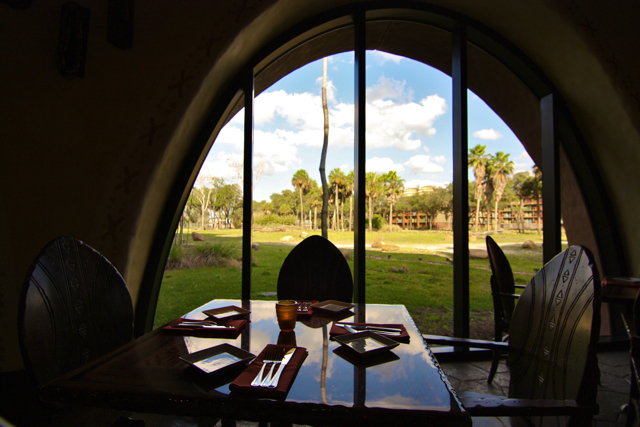 Either way, be sure to check out the animals on the savanna viewable through the windows before the sun goes down. On the other hand, if you want to see Jambo House, try the previously reviewed Culinary Tour of Boma and Jiko. That tour offers a glimpse into two restaurants, but I don’t consider either half as beautiful as Sanaa. Then again, you get double the samples – so it’s a toss up! You really can’t go wrong with either tour. The Sanaa Cultural Tour is currently offered at 4 p.m. daily. 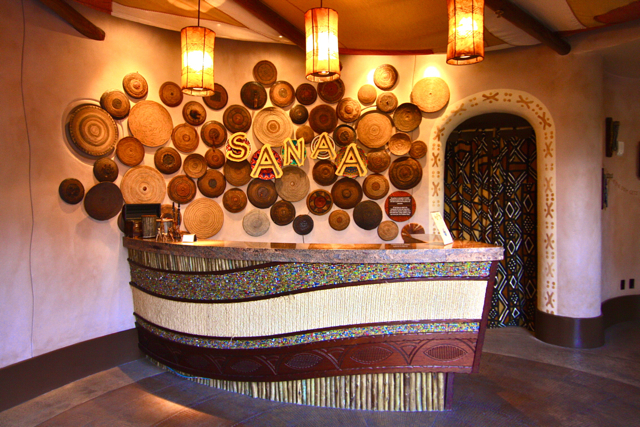 No reservations are accepted, and all you need to do to attend is show up at the Sanaa podium in the Animal Kingdom Villas. The tour is open to all ages and lasts 20 minutes. As resort activities can change monthly, check the Resort Activites Calendar or call (407) 938-3000 to confirm the tour schedule. 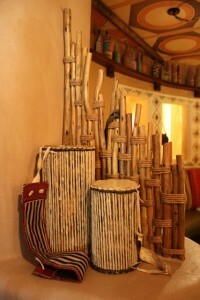 Have you tried the Animal Kingdom Villas Sanaa Cultural Tour? Do you plan on trying it out on your next trip? Let us know what you think! I had no idea this existed. Awesome review, Lindsay! I definitely want to try and do this on my next trip, and the one at Jambo House too. Great article. This is one of the best, if not the best, restaurants on property. Check out the meal with the animal keeper (I forget the official title) if you can, it’s a blast. I’m dying to try out the Dine with an Animal Specialist experience! I got to meet a few of the Animal Kingdom Lodge & Villas keepers back when I did the Sunrise Safari. They were truly amazing, and I can only imagine being able to talk with them in a smaller group would be wonderful. I’m a bit tour obsessed & this one didn’t come up in my initial tour inventory. Kidani is a tricky place – on my way to this tour, I saw a sign for another free tour I had never heard of: “African Inspired, Disney Designed.” I can’t wait to go back and review that one too! These free tour blogs are great! How do you go finding out about those free tours, if you are not staying at the resorts? On one of the podcasts I listened to recently a guest asked about ideas for touring resorts, and I think this would have been a great suggestion. 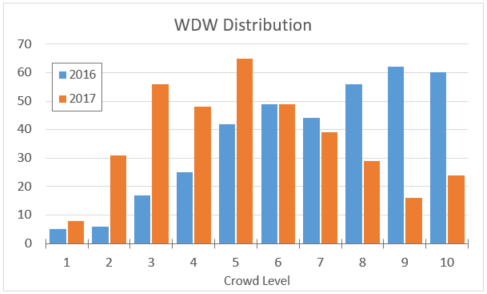 When I started researching Disney tours, I just relied on a lot googling and browsing of DIsney fan sites for tours beyond the paid ones listed on Disney’s site. In general, looking for the activities calendars for each resort is a good way to start. These are often on resort fan pages or in the message boards of large sites in the Disney community. I recently searched the calendars for all the deluxe resorts and didn’t uncover any tours I wasn’t already aware of. In some cases, the tours aren’t even listed on the calendars. To be honest, I started my own site dedicated to Disney tours because I found this information hard to find & often out dated. Fortunately, I’ve been able to team with Touring Plans to get the word out on these hidden gems. Other than the tours already featured in this Free Tour Series, I only know of one other resort tour. 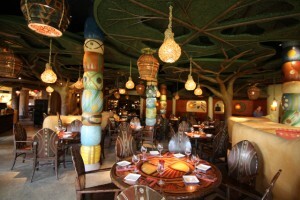 African Inspired, Disney Designed is another 4pm daily tour that meets at the Kidani gift shop. I haven’t done this tour yet, but I’ll be reporting back on it soon. The green stuff is a coriander chutney. Trying to describe this to someone who’s never had it is futile, as its flavor varies pretty widely between different restaurants. Every Indian-esque restaurant does it a little bit differently.